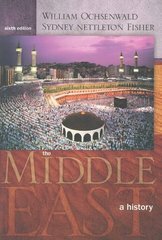 The Middle East: A History 7 Edition Now celebrating its fiftieth anniversary, The Middle East: A History has long been the standard introductory textbook in the field of Middle Eastern history. It is the most comprehensive one-volume treatment of Middle Eastern history from the rise of Islam to the present time now available, featuring full coverage of the central and peripheral Middle East. There is a thorough and balanced discussion of the political, religious, social, gender, economic, and cultural history of the region. As a comprehensive textbook, it provides teachers and students with a general introduction in narrative form to the chief elements in Middle Eastern history, thereby allowing readers to proceed into more specialized topics and themes with a firm understanding. This new edition features major revisions for the period from 1939 to the present, including updated analyses of Iraq since 2003, the status of the Arab-Israeli peace process, and the administration of Mahmud Ahmadinejad in Iran.